Pierre Kwenders is a man of many talents born out of a vivid cultural background. Kwenders is not just riding the wave of new age African artists, he is humbly spearheading it from his home base in Montreal with support of Bonsound. Born José Louis Modabi in Kinshasa (Congo) Kwenders retained a lot of loyalty to his heritage. His most recent album, MAKANDA, is a great example of modern African music coming together with Congolese Rumba into a bouquet of postmodern pop. You’ll notice Kwenders sings on 5 different languages, but as Noisey points it out “don’t call it world music,” it is not a term he find particularly endearing. 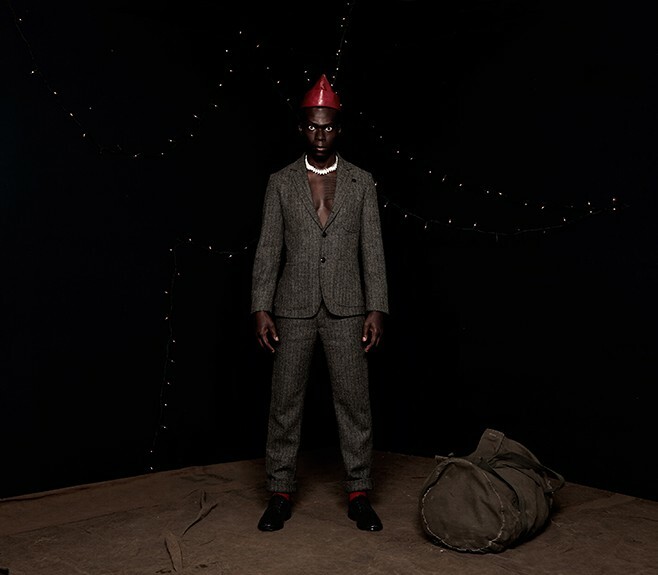 Quite frankly, there is a lot to be said and learned about Pierre Kwenders so we figured the best way to get to know the man is through a chat. Kateryna Topol: Hello José, how is your summer going so far? KT: Deffinitly not the kindest cities in terms of weather… Do you recall the moment you decided to take up music? PK: I remember the first time I’ve recorded, back in summer 2011. It was scary to hear my own voice on recording, but from that point on I knew that I needed more of those scary moments. The song was titled “Treehouse”. KT: You have a new album on the way, MAKANDA, how long has that been in the works? PK: This album took two years to be done. It was definitely a new adventure full of surprises. The biggest challenge was to record a full length album in a city far from home while still touring with the previous album. Seattle was inspiring and became my second home for the moment. KT: The new album was produced by Shabazz Palaces’ Tendai Baba Maraire, how was that collaboration? PK: Working with Tendai was as exciting as anyone can imagine. I’ve admired his work for such a long time and being able to collaborate with him was a dream coming true. To top it off, the connection between us was natural. We had the same vision which made the work easier. KT: Ish also appears on the record in “Makanda” – how did this collaboration with Shabazz Palaces begin? PK: My manager and I reached out to Tendai a few months after my first album came out. Being a fan, I’ve always dreamed of one collaboration with Shabazz Palaces. Tendai answered back and seemed to like my album. He invited us to Seattle. Got there, worked on a song. From that point, we just knew that we needed to make a record together. Having him on it was just the icing on the cake. KT: That’s amazing! … I’ve read you draw quite a bit on your Congo roots, where else do you turn for inspiration? PK: My family and friends have such a huge effect on my life. I believe that they’re my everyday inspiration. KT: How has Montreal been treating you, I understand you are quite involved in that music scene? PK: Montreal has shown me love since day 1 and I try to give back the love every time. With my collective Moonshine, we contribute to Montreal nightlife and joie de vivre. It’s all about creating good vibes, sharing good music and making memorable souvenirs. KT: What’s next for Pierre Kwenders? PK: Once the album’s out, I have a few tour dates in the province of Quebec and Ontario. In October, my band and I are flying to the UK to support Ibibio Sound Machine then on our own to France. More dates to come. KT: Exciting! One of those upcoming shows is at FME, have you been before? PK: I’ve played FME d’hiver as Pierre Kwenders, then played the summer FME with ABAKOS (my side project). It’s always a fun festival. Good vibes, good people, nothing can go wrong. I’m looking forward to present some of new songs to the public, make them dance and wave their hands in the air and act like they just don’t care. KT: And a few quick questions: What are you listening to this week? KT: Favorite spot to eat in Montreal? KT: Best show you ever played? KT: Ah! All right, thank you for your time and have a great show at FME!